Our products are phosphorous free, and always have been. When mixed with water as directed, SuperRoots is a ready-to-apply complex bio-fertilizer, made with fulvic acid, that provides macro and micro-nutrients, mycorrhizae, and microbes for tree and shrub liquid root treatments. View a short video about SuperRoots treatment methods. We recommend the Green Garde HD-9 Surface Root Feeder with the spring cup. SuperRoots has been used extensively on varied Pacific Northwest landscapes, soils and environments. It has proven to correct nutrient deficiencies and provide vital biological components necessary for water and nutrient uptake. The diluted liquid delivered to the soil should be 5.5 to 6.5 pH, depending on the pH of the water used in tank mixing. This range is ideal for most trees and shrubs. When used in a plant health care program, SuperRoots has been shown to stimulate rapid fine root development, aiding in the recovery of damaged root systems. In turn, foliage/flowers benefit from mineral/nutrient uptake, enhancing color, leading to improved photosynthesis and plant health. Every once in a while a candid comment comes along that’s worth sharing and I’ve copied one below. It’s from a prominent Northwest landscaper based in Olympia, WA. He’s been using Plant Essentials’ SuperRoots for a couple years now and he’s experimenting with root washing. He either dips or drenches roots at planting. SuperRoots can be applied any time soil conditions will allow. Application to frozen or drought stressed soils should be avoided. For trees, fall and winter applications will result in beneficial responses the next spring. Spring treatments may follow if trees will benefit from increased wood tissue development, e.g. when callous tissue is needed to close wounds or increased canopy density is desired. The product label has specific directions relative to the proper placement of the fertilizer in the shallow fine root zone, which is vital for maximum uptake and performance. As a tree fertilizer, SuperRoots encourages normal growth but will not result in surge growth. The moderate level of organic/synthetic nitrogen is treated to release slowly and completely for approximately 2-3 months, which should not stimulate harmful root rotting fungi. As a shrub fertilizer, SuperRoots will encourage chlorophyll production, enhancing leaf/needle and bloom color and plant vigor, but will not stimulate excessive growth. Applied in the spring, plant responses follow rapidly, usually within 30 days. Applied in the fall, color responses can be expected within 60 days if mineral/nutrient deficiencies were present at the time of application. Both fall and spring treatments result in a continuous healthy appearance and normal growth. SuperRoots contains low biuret urea (not feed grade urea; we choose low biuret because biuret can be toxic to plant roots), nitrogen protected with Nutrex M-F to minimize volitization and leaching, soluble potash, SuperTrace 6% iron (fully chelated micro-nutrients with fulvic acid), OMRI approved endo/ecto mycorrhizae with root shielding tricoderma/scleroderma, and SoilSeeds (USDA organic compliant soil microbes, fulvic acid-carbon amendment and brown seaweed extract). SuperRoots contains no phosphates and no harsh acids, and can be applied safely to the roots of all plants that benefit from root fertilizing. 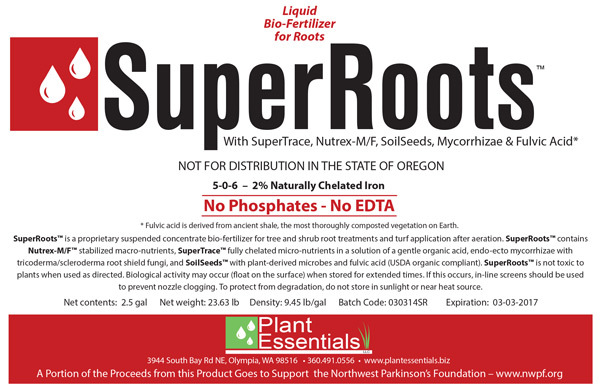 SuperRoots micro-nutrients are naturally fully chelated with organic acid, and contain no EDTA. EDTA is known to be a pollutant persisting in the soil for decades after application. Full chelation provided by the fulvic acid-carbon amendment protects minerals from oxidation by reducing their molecular size for rapid assimilation by fine roots. Fulvic acid-carbon amendment enhances the uptake of minerals, since roots have an affinity to the compound. Minerals “hitchhike” on the fulvic molecule and roots readily take them in. If faster growth is desired, more nitrogen can be added. We recommend the user exercise caution when adding nitrogen if root rotting fungus is known or suspected. Excess soluble nitrogen may stimulate damaging fungi, raising the chance for soil borne disease infection. A soil nutrient analysis and disease pathology report is advised to establish a base line for a treatment program. SuperRoots contains lab-identified strains of microbes (our SoilSeeds product) that begin to proliferate within minutes of application when soil temperatures are 50° Fahrenheit or higher. The microbes naturally break down fertilizer and organic matter into nutrients for root uptake. Most modern urban maintenance practices lead to nutritionally and biologically deprived soils since leaf/needle debris is typically removed as part of regular, tidy urban landscape up-keep. That tidy practice can leave little organic matter for biological nutrient cycling. As a result, supplemental bio-fertilizer treatments are recommended to provide the essential minerals/nutrients and biological components. In addition the common practice of mulching with bright, fresh bark is non-supportive to plant material, robbing available nutrients for decomposition. Rock or rubber mulches give no nutritional or biological benefit and can, in fact, create a super-heated environment that can destroy resident biological components in hot weather. Biologically active compost or aged bark would be much better sources of mulch and would be recommended over the above-mentioned non-supportive types. Where the above practices are common, SuperRoots treatments support or re-establish the biological systems necessary for nutrient/organic matter cycling resulting in renewed soil and plant health. SuperRoots is a suspended concentrate that mixes easily with water and stays suspended under adequate agitation. It will not plug nozzles when diluted as directed. 50 mesh screens are preferred due to the size of the mycorrhizal spores. Agitation is recommended for several minutes before each use to ensure all the components are thoroughly suspended. If application instructions are followed, SuperRoots treatments will bring the desired results.